When a patient suffers from a cavity and a filling is required, Erie dentists Dr. Matheson and Dr. Holecek can repair the damaged tooth and prevent further decay with the placement of traditional amalgam and aesthetic composite fillings. Composite fillings are closely matched to the shape and color of surrounding teeth in order to both protect your tooth and provide a seamless smile. 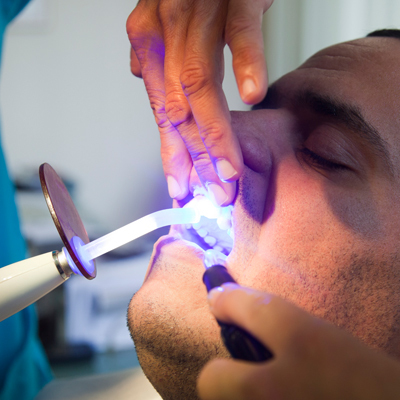 These natural-looking fillings can usually be completed during one office visit and will significantly improve the appearance of a tooth. Dr. Matheson and our team at Impressions Dental have elected to make our office a “mercury-free” environment. As a result, we have chosen to discontinue the use of amalgam fillings in our dental treatments. Commonly known as silver fillings, amalgam fillings have several disadvantages when compared to composite fillings. One of the biggest and most serious concerns to the health of our patients’ teeth is that the metal in an amalgam filling can expand and contract, causing cracks in teeth that can lead to further decay and the need for additional dental work. Amalgam fillings can also corrode and cause stains to develop on your teeth and gums. If you have received amalgam fillings over the years, Dr. Matheson and Dr. Holecek will closely monitor them for any signs of failure. At Impressions Dental, we take great pride in providing our patients with dental work that gives you the healthiest smile possible. Dental crowns look and feel like your natural teeth and are made from materials such as high-grade porcelain, ceramic, or porcelain bonded to gold. Besides strengthening a damaged tooth, a crown can be used to improve its alignment, shape or appearance. A crown can also be placed on top of an implant to provide a tooth-like shape and structure. Most importantly, porcelain or ceramic crowns can be matched to the exact shade and color of your natural teeth. Placing a dental crown typically requires two visits to our Broomfield dentist office. The first appointment allows Dr. Holecek to remove any existing decay, shape the tooth, and then fit the tooth with a temporary crown. On the subsequent visit, Dr. Holecek will remove the temporary crown, replacing it with a permanent crown that will be cemented into place to create a new, beautiful looking tooth. The overall health of your teeth and gums becomes threatened after losing a tooth. Fortunately, adult tooth loss can be easily treated with placement of a dental bridge. 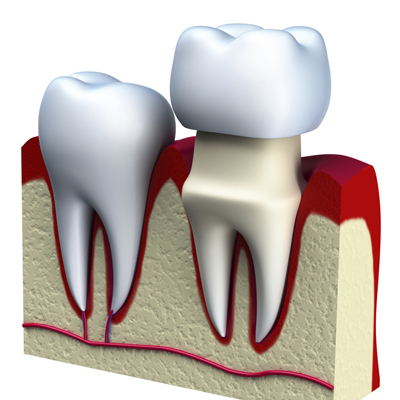 Dental bridges literally bridge the gap created by one or more missing teeth. A bridge is made up of two or more crowns for the teeth on either side of the gap — these two or more anchoring teeth are called abutment teeth — and a false tooth in-between. 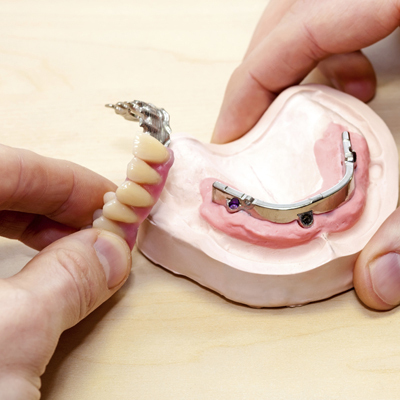 Placing a dental bridge will continue to provide the structure needed to maintain proper functionality of your mouth. Dental bridges can be made from a variety of durable materials, including porcelain, gold, or a combination of materials. Fitting a dental bridge in Erie, CO usually takes two appointments to complete at Impressions Dental. Dr. Matheson will take time to prepare the teeth on either side of the space prior to taking impressions of your teeth that will be sent off to the lab where the precise construction of your dental bridge will be completed. Between the first and second appointment, a temporary bridge will be provided to protect your teeth.